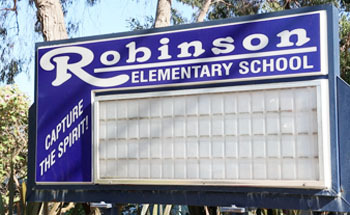 Located in the heart of the Sand Section, Robinson Elementary School is a California Distinguished school with an API rank of 10, meaning it is among the top 10 percent of all schools in the state. This year it was nominated as a 2013 National Blue Ribbon School by the U.S. Department of Education for its outstanding student academic performance. Located on Morningstar Drive, Robinson Elementary is technically in the Sand Section, but many Hill Section kids attend as well. Robinson Elementary focuses on personal development, and integrates a Character Counts program into curricula and school-wide activities. The school also offers students opportunities to do community service projects, grow and harvest their own food in an on-campus garden, participate in reading groups, or mentor younger students. Like most Manhattan Beach schools, Robinson Elementary provides a service called Walking School Bus, which exists because of the work of volunteers who walk kids to and from school. Faculty focuses on healthy living, incorporating nutrition lessons into curricula and offering students a chance to taste fruits and vegetables grown by local farmers during a monthly workshop. Parent participation is high at Robinson Elementary, and nearly 100 percent of parents are members of the PTSA, which works to supplement educational grants and donations from the Manhattan Beach Education Foundation. If you’re in the Sand or Hill Sections, you can trust Robinson Elementary will give your children an excellent, well-rounded education. For official information, visit the Robinson Elementary official website or the Manhattan Beach Unified School District.